There is a reason why certain garments advise dry cleaning. The type of fabric, color, blend and style all contribute the make-up of the articles in your wardrobe and their “life span”. The color dye of a garment which is applied using water has the ability to come out in water but is colorfast when dry cleaned. The fibers in some materials made from different animal hair have a tendency to shrink if washed in water unless cleaned with special chemicals. Some trims and glues used in manufacturing can dissolve or be damaged in water, especially intricate add-ons. The material/blend of certain fabrics is altered to feel a certain way with chemicals and need special attention when cleaning unlike a laundry load set on hot-cold. Last but not least, pleating can be affected or damaged when washed in water. It is extremely important to read labels and make smart choices to preserve the life of your dry cleaned wardrobe. Mark Pressed4Time handles with care in a quick and timely matter. 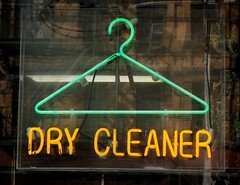 Not only do we deliver dry cleaning, we cover alterations and shoe repair. Relax and cross "dry cleaning” off your to-do list.